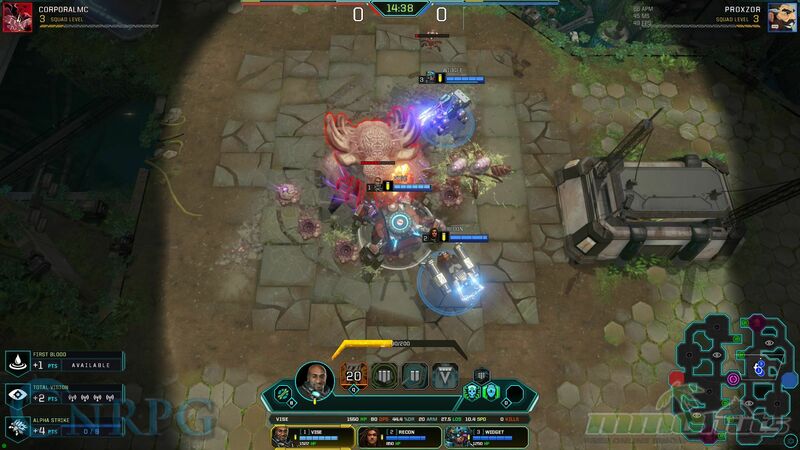 In the last few years we have seen a lot of developers take a go at hoping on the MOBA bandwagon train. Most get run over after missing and hitting the tracks. A couple of the smarter ones have identified that the fantasy realm is on lock and instead have taken a different spin on things. 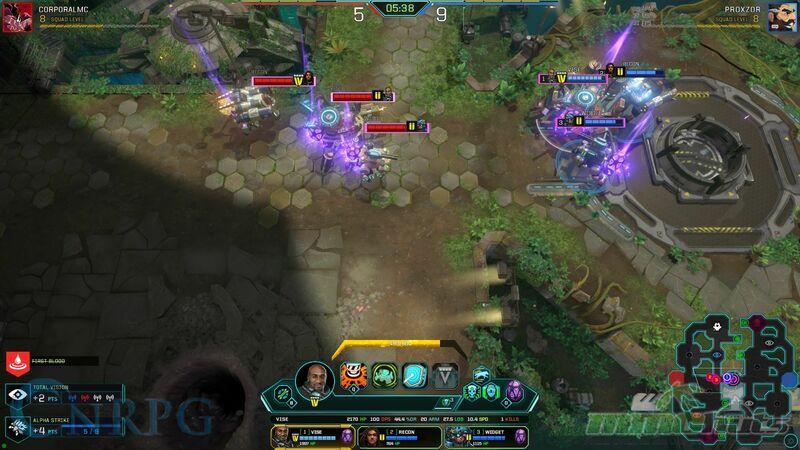 Whether its a sci-fi setting or more RPG elements, we’ve seen plenty of new takes on the MOBA genre, good and bad. 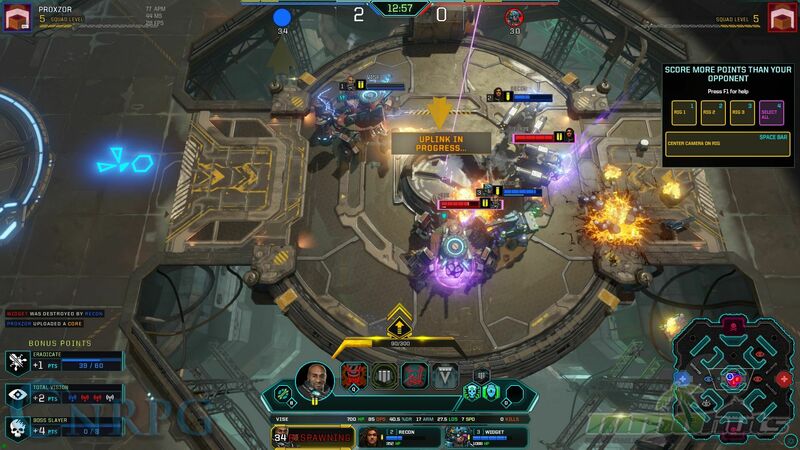 Dropzone is one of these games, mixing sci-fi with a call back to the RTS roots of the MOBA genre. 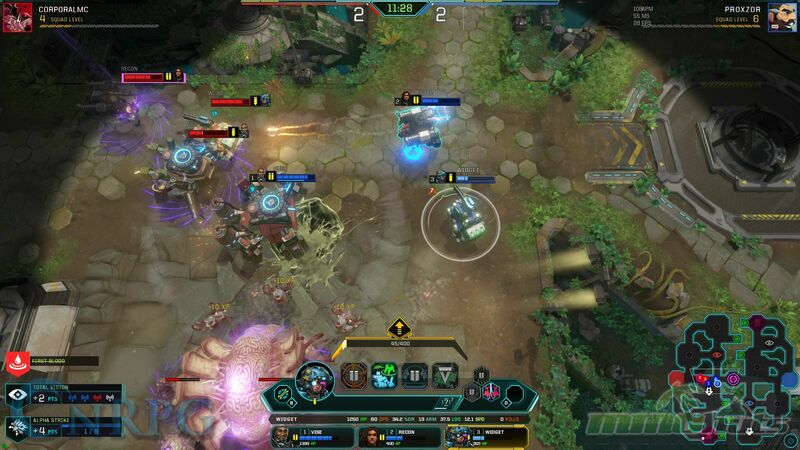 Basically its an RTS wearing a MOBA Letterman’s jacket, but you can’t classify the game as strickly one or the other. But the question is, is their idea innovative enough, and can they implement it well enough to draw an audience? Let’s find out. In most real time strategy games you usually start out slow, and build your army up from there. But besides having an army, actual buildings usually have an important role to speed up your progression and grow your army into something stronger or unique to your strategy comparative to what everyone starts out with. And in these genres the terms Micro and Macro are widely known: Micro stands for how well you can control your units, and Macro usually means for how well you can produce your units, upgrade them, and expand your economy. 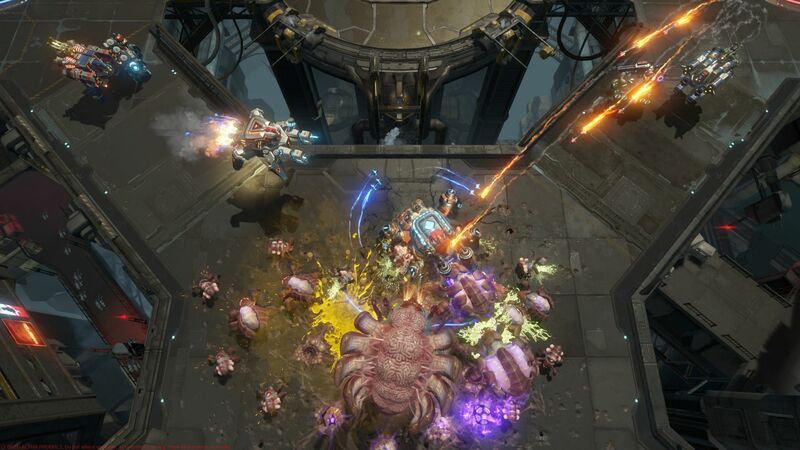 Dropzone basically removes Macro from the equation, and while there are still a bit of resource collection involved, games come down to who has the ultimate Micro management skills over their team of three pilots. Three pilots you might ask? Well before we talk about that, lets first talk about the setting Dropzone takes place in. If you like Mechs then look no further, Dropzone is all about its Mechs, and about the builds you can run with them. Even though I try to compare Dropzone to a MOBA, it distances itself so much from the core mechanics of MOBAs that it is barely recognizable. Pilots are the closest thing to heroes, but matching up different pilots with different mech classes results in entirely different loadouts. Thus a few options of pilot and mech expounds into a massive variety of team compositions when you are forced to build three characters out for your team. This is only going to grow exponentially as more mech classes and pilots get introduced over time. Plus, pulling from the RPG field, you unlock even more possibilities as new skills become available as a reward for playing a set amount with each pilot. Currently there are three types of mechs that you can pick from. The Tank, who soaks up most of the damage in the frontline, the Gunner who does its heavy damage, and the Mechanic who functions as the support type of Pilot, that starts out with a healing ability. 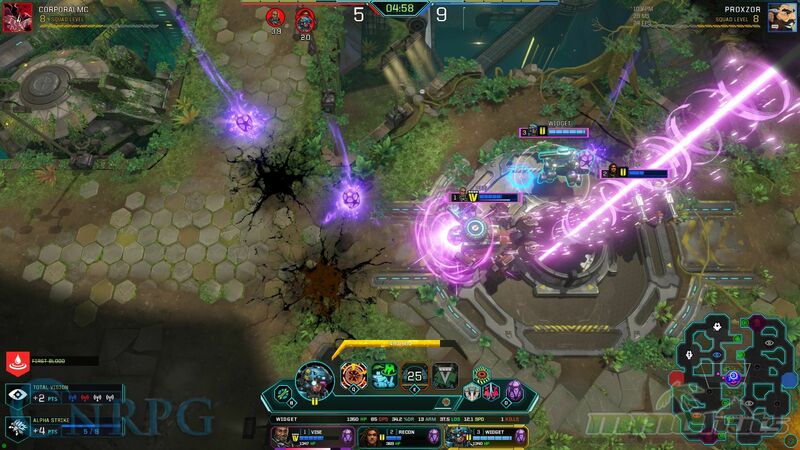 Each individual Mech has three abilities which unlock over time as a match progresses, improving the strength of the Mech to allow the early winner to start steam rolling towards victory. Besides the normal abilities, you also get three passives, and just like the abilities you also are able to unlock extra passives, so you can really play around with the Mech and make it fit in any build you have in mind. Now onto the format of the game! 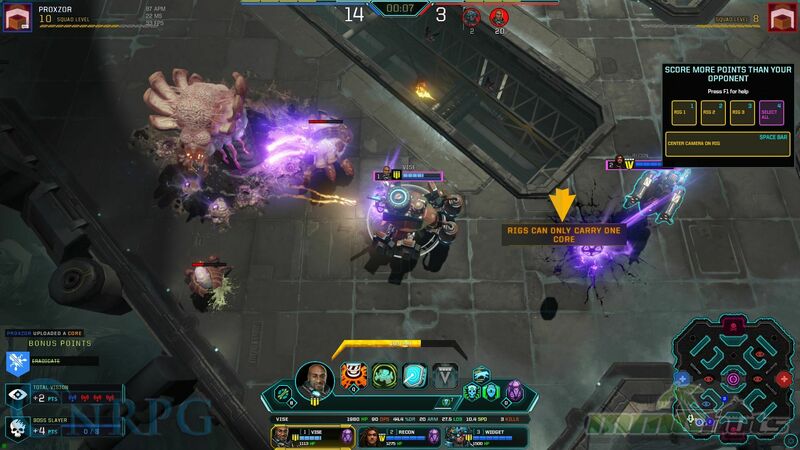 In Dropzone the main game mode is the one versus one game mode. Here you will fight it out with your three Mechs against the opponent’s mechs. The objective of the game is very simple: farm as many cores as you can before delivering them via the payload in the center of the map. But how do you obtain these said cores? Well scattered all around the map you will find a hive full with random alien monsters. Once you kill off its minions and the big boss baddie himself, cores will drop as pick-up items. You can then pick one core per Mech up, and deliver this to the middle of the map at the payload. Since your opponent has the same objective you really have to play around with a solid strategy, and anticipate what exactly your opponent is doing at any time. Map awareness, micro skills, and knowing when to group versus when to split your forces all come into play. In my first game against another player, I faced a mirror match of the same mechs. The only difference was the enemy tank brought Flamethrower instead of my heavy AoE attack. I decided to go straight towards the first hive and get at least one core delivered as soon as I possibly could. Around the map you can also find watch towers; by standing on these towers you will gain visibility around the tower once you activate them like a ward. I decided to roam around with my Mechanic to unlock a few of these towers to figure out what my opponent was doing. At the same time I was sending my tank and gunner to the next hive to keep my core lead. Through my wards I confirmed he was sticking all his units together to try to speed up farming hives, but since the Mechanic doesn’t really add much in the damage department, and early aliens aren’t too brutal on your units, I overall had the advantage. Knowing my opponent preferred brute force over map awareness, I already was formulating a winning strategy. When you deliver a payload, your Mech is unable to do anything unless you cancel the channeling for delivering the core. The channeling takes what feels like ages but is only about five seconds to completely deliver a core, but you can only deliver one core at a time, and a bright blast of light and sound informs your opponent that the transfer has begun. Knowing this, I used it to my advantage by starting a transfer while my Gunner Mech set up in ambush position to blow him away as soon as he rounded the corner. The barrage caught him off guard and forced a retreat to his safezone to heal. After dropping my cores, I then pulled back to set-up an ambush to try to claim his core. He only sent his gunner mech over to the payload to try to sneak a single core in. Gunners are glass cannons, and extremely susceptible if caught out of position. Since I controlled both vision markers on his side of the map still, I was relatively confident his gunner had no back-up, so I snuck my Tank and Mechanic to his side of the map before baiting him into a 1v1 gunner battle trying to lure his gunner towards my safe zone. Everything went as expected. He canceled the channeling, tried to flee thinking I was luring him into a trap on my side of the map, and ran his gunner straight into my tank and mechanic. I wiped the gunner and had plenty of time to deliver another core unimpeded along with 2 more cores I had been waiting to offload. With such a substantial lead, I didn’t care much what he would do and hurried off to farm the final cores I would need for victory. Over time, the hives start dropping more cores than the initial one, and thus you can easily get all of your Mechs to carry a core to the payload. However the aliens grow in strength to match the added reward, and the possibility of running into your foes while fighting aliens grows. However with such a stark core advantage, my characters were leveling far faster than the map scales, and neither the aliens or my Micro inept opponent could slow me down. If your Mech dies, it will respawn after a time delay at your safe zone. In the safe zone damaged Mechs also get healed up, and thus its a really safe place to stick around to if you get bullied on the field. Though gameplay emphasizes tactics over bullying and kill farming. You aren’t really rewarded for killing your opponent outside of having one of their mechs off the battlefield for a time. The three mech system makes being down a single mech extremely punishing, especially when you consider that farming aliens isn’t the only method of obtaining cores. Various achievement style missions will appear at the start of the match that only one side or the other can be the first to accomplish. This includes taking out a big nasty alien at the edge of the map, being the first to control all ward towers, and so on. Since you aren’t limited to bringing one of each class into the field, a lot of unique crazy tactics are possible and even viable if you bring the right set of skills into the fray. However most of these advanced tactics are still a dream in my mind as I further learn the game. My first opponent brought none of them to the table, and surrendered the match with five minutes remaining once recognizing my lead was insurmountable. Most RTS games of this day and age are lacking something, and sometimes do not have an active development team behind the game to keep the game fun and progressive. Dropzone has the ultimate package to keep the boat sailing for a long time: the game in itself is extremely fun, between match progression is meaningful and rewarding, and there are enough viable tactics to keep tactical players interested in testing builds for a long long time. I compared this game also to a MOBA, because despite having to control three different Mechs, it still looks and plays like a Multiplayer Online Battle Arena game. It’s almost like after so many MOBA fails, someone finally picked up the right jigsaw pieces from their broken projects to fit them together in the ideal portrait. Right now the game is still in a closed beta, but if you get lucky enough to get in, it’s already in a fun enough state to enjoy.